Unsurpassed for brilliant autumn color. 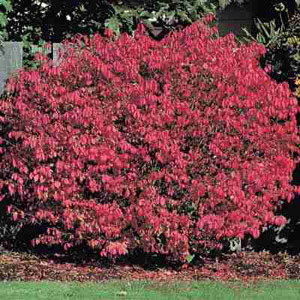 Very hardy and carefree, Dwarf Burning Bush grows into a 6 and 1/2-foot plant with elegant form, and in the fall the foliage turns to a brilliant scarlet and decorative bright red berries bring birds. Attractive bark adds winter interest to the landscape. Used primarily as a low-maintenance hedge or background subject.